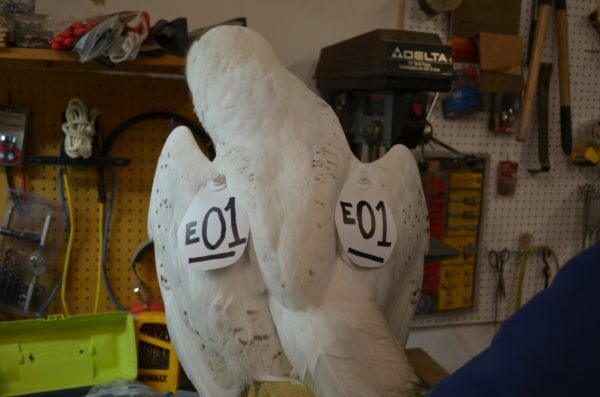 Observers in some parts of North America may encounter snowy owls sporting patagial (wing) tags, which are plastic flaps of various colors with a letter or number combination. These birds are not tagged by Project SNOWstorm, and we do not monitor their movements — our study subjects are marked with USGS leg bands and GPS/GSM transmitters. Some of these owls with patagial tags are marked by USDA Wildlife Services as part of a multi-year study of owls at airports, and some are marked by individual banders in the U.S. and Canada. Federal banding authorities in both the U.S. and Canada, which are always monitoring best practices for tracking wild birds, would appreciate observations from the public of such tagged owls, which are then shared with the respective researchers. Please report wing-tagged owls in either country (with location, date, tag color and code) to the U.S. Bird Banding Lab.